Restoring historic interiors requires a certain delicacy and the Conservancy’s talented staff of historic conservators has the experience and refined skills required to tackle the most intricate details. From early colonial to art deco, the Conservancy’s team will successfully execute your interior project. To view our awards in historic preservation click here. Fairmount Park Conservancy was hired by the University of Pennsylvania to restore areas of water damage in the Main Hall of Irvine Auditorium, the English Medieval-style theater designed by the renowned firm of Horace Trumbauer in 1926 and completed in 1932. 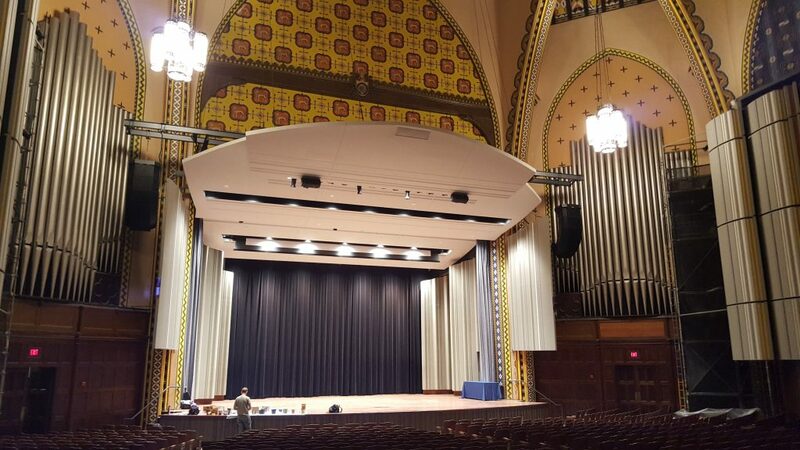 The main auditorium’s inner walls depict the philosophical history of the University, and seats 1,259 and it houses the Curtis organ, the eleventh largest pipe organ in the world. In the Main Hall, the Conservancy restored deteriorated plaster molding on the ribbed arches and other decorative surfaces. Decorative finishes were also restored, as were mahogany wood-paneled walls that had been damaged. The Conservancy also removed water staining from a large drapery panel.